Aloe: Apply the fresh gel from the leaves to minor burns and sunburn, blisters, scrapes, and minor wounds. Helps to promote healing and prevents infection. Do not take internally. 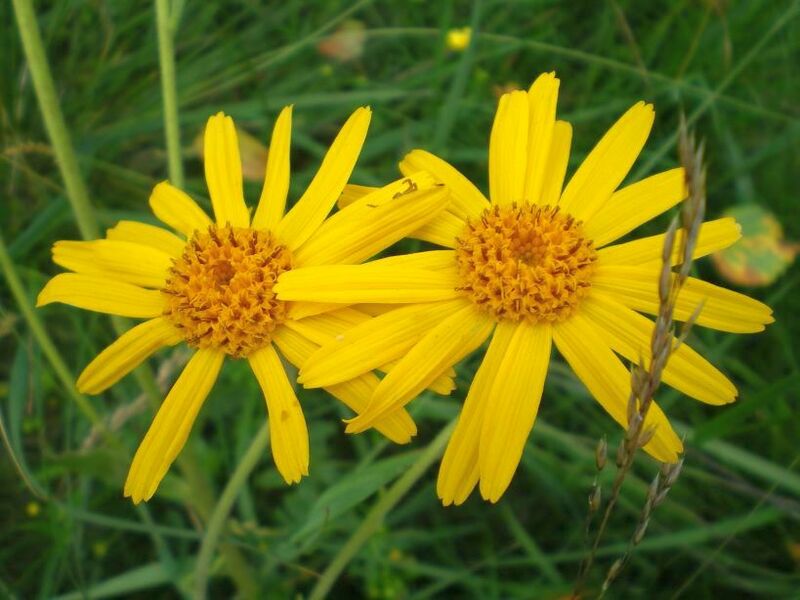 Arnica: Make an tincture of the flower heads and apply as a poultice or compress. Witch Hazel and apple cider vinegar make the best tinctures. Add a handful of the flower heads to a few ounces of the vinegar or hazel, let steep overnight, and use this liquid for sprains and sore muscles. Do not take internally. (Photo of arnica flowers above). Barberry: Prepare a tea from the dried roots and drink 1 cup daily for antibacterial and laxative effects. Calendula: Great for stings, bruises, scrapes and burns. Add 2 tablespoons of dried calendula to a 1cup of witch hazel. Let it steep overnight, strain out the calendula, and use this herb infused liquid as an antiseptic spray or lotion. Catnip: Make an infusion of dried or fresh leaves and 8 ounces of boiling water. Drink this infusion when needed for a calming effect or to aid in digestion. Comfrey: Make a compress or poultice from the leaves and apply to bruises or sprains. Or add dried comfrey leaves to olive oil or grape seed oil and use as an ointment to treat minor burns or abrasions. Do not take internally. Eucalyptus leaves: Make an infusion from the leaves and inhale the vapors as a decongestant and to relieve flu and cold symptoms. Fennel: Make a tea from the seeds or leaves and drink one cup daily to relieve gas and upset stomach. Garlic: Add peeled cloves to olive oil and let it infuse for 7 days. Use this oil to treat skin infections, and minor burns. Parsley: Use fresh or dried parsley for making a soothing tea that will relieve constipation and help heal minor infections. Peppermint: Chew fresh leaves for bad breath, or add fresh or dried leaves to one cup of boiling water for a refreshing tea that will help with stuffy nose or sinus. Rosemary: Use the dried or fresh needles for tea, or as astringent for oily skin or acne. Crushed leaves can also be used in a poultice for cramps and sore muscles. Sage: Brew the leaves for tea, or use the sage water for disinfecting minor skin infections. Add 1/2 cup of fresh or dried leaves to a quart of water. Cover and let stand for 10 days. Pour off the leaves and use this antibacterial liquid for scrapes and little nicks on your finger tips. Thyme: Used dried leaves for a soothing tea, or as a gargle for sore throat. Use thyme in steam inhalation to relieve a stuffy nose. This article is not intended to replace advice from the medical profession. As with all herbs, consult a health care professional before using. When real food and herbal medicine is outlawed- only outlaws will have them.